A dog which died protecting a group of children from two pitbull terriers in New Zealand has been given the highest honour for animals. 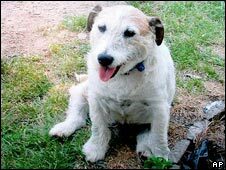 George, a Jack Russell from Manaia, in Taranaki on New Zealand's North Island, fended off the two dogs, allowing the children to escape. But he was badly hurt in the April 2007 incident and had to be put down. His owner, Alan Gay, was presented with the PDSA gold medal by New Zealand's Governor-General Anand Satyanand. Mr Gay paid tribute to his pet. "He was a brilliant little dog, intelligent. You couldn't insult him. I'd call him 'dipstick' and he wouldn't have anything to do with me," he told TVNZ. George is the first dog from New Zealand to receive the honour, which is the equivalent of the Commonwealth's highest civilian honour, the George Cross.